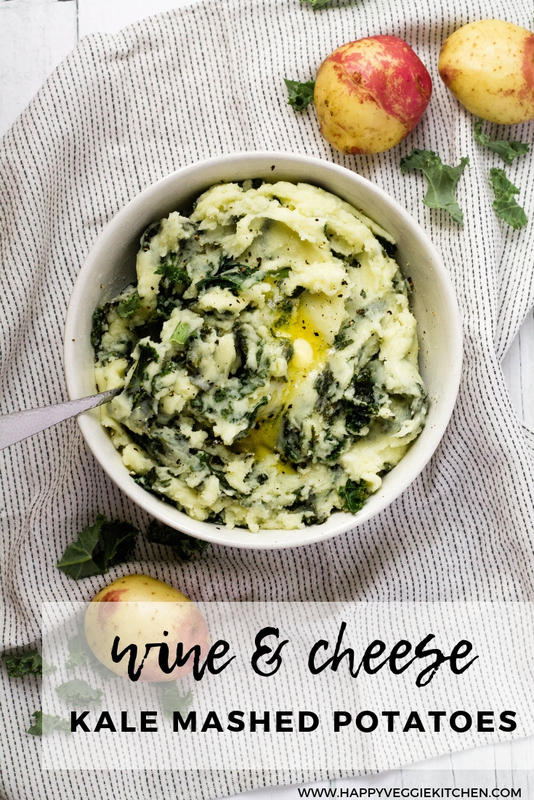 Juicy, garlicky, wine infused kale is mixed in with creamy, cheesy mashed potatoes for this decadent twist on colcannon! An amazing side dish packed with flavor and nutritious greens. Chop your potatoes into quarters and drop into a saucepan with boiling water. Boil for 20 minutes, or until the potatoes are soft. Meanwhile, prepare the kale. Heat a little olive oil in a deep saucepan or wok, and then stir fry the kale for a couple of minutes until it just starts to soften. Grind in a generous amount of salt and pepper followed by the garlic. Stir fry for 1-2 minutes, until the garlic is giving off lots of fragrance but is not yet browned. Finally, pour in the wine. Cover and allow the wine to steam the kale for about 5 minutes, or until it's cooked through. Lift the lid to stir every now and again, and if the liquid disappears too quickly you can add some extra wine. 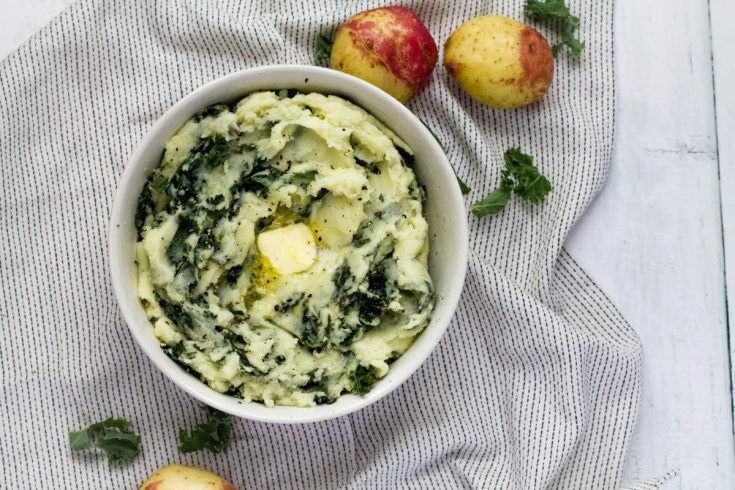 Once the potatoes are ready, run them through a potato ricer or whip with a mixer to get them super smooth. Then add them to the pan with the kale. Over a low heat, add the butter, olive oil, milk and cheese to the pan and stir continuously while everything melts in. Use as much or as little milk to achieve the creaminess you prefer. Eventually once the cheese and butter have melted, it should be very easy to stir and will come away from the side of the pan easily. I like this to be a little dense and sticky, but if you prefer more creamy and moist potatoes, add some extra milk. What an awesome recipe! I love kale. I’ll fwd your website to my friend that’s turning vegan. This was delicious and a big hit at our office potluck. Thanks! Another winner, Christine! My husband says 5 stars. Yummy!